I must first start by stating clearly and openly that I am a Kylie Minogue fan, so if you are looking for a completely unbiased review of this album, you may be looking in the wrong place. It happened the moment I saw the music video for 2 Hearts. I was twenty years old and still believed deeply that my taste in music was far superior to everyone else in the world (or at the very least, in my social circle). I was under the impression that the only music worth listening to was sung by guys wearing eyeliner who never smiled. "Oh, you've never heard of Forgotten Sorrow? I discovered them on MySpace. They're just, like, real. You know?" Something changed the moment I saw Kylie perched on the piano at the start of that video though. I started to appreciate the catchy hooks, the sparkling outfits, and the heavily produced sound of pop music. I realized there is no better cure for the blues than a night out with a group of friends, a few drinks, more than a few laughs, and the thumpa thumpa of a good dance beat… and no one does a dance beat quite like Kylie. I was intrigued when I heard Kylie would be releasing The Abbey Road Sessions, an album to celebrate her 25 years in the music industry, recorded in London's legendary Abbey Road Studio. The album was recorded with a full orchestra and features sixteen of her biggest hits, rearranged, re-imagined, and stripped of the high-end pop production she is famous for. Would I still love her as much without all of these aspects that drew me to her initially? When Emma asked if I would be interested in writing a review for her blog I jumped at the chance. From the first listen I was head over heels for this album. All of the things I thought I'd miss were completely forgotten when I heard the truly stunning backing orchestra that compliments - without overshadowing - Kylie's vocals. Her talent is really allowed to shine on this album, proving that she is a pop icon for a reason! The stripped down production also gives the listener a chance to really appreciate the emotion in the lyrics that can sometimes get lost under the strobe light. Each track offers a fresh take on Kylie's greatest hits and are each worth a listen (Check out the album sampler on YouTube), but there are few that stand out to me in particular. The third track, Better the Devil You Know, was one of my fast favorites. The video for this song, originally released in 1990, almost seems laughable now with its super synthesized sound and ridiculous 90's fashion (I'm almost certain I saw Kelly Kapowski wearing the same metallic silver hot pants in an episode of Saved by the Bell). The Abbey Road recording turns the song into the ballad it seems it was always meant to be. With lyrics like, "I'll forgive and forget if you say you'll never go. Because it's true what they say, it's better the devil you know…” it made me want to start looking up old flames (Egads!)! Track ten is the Kylie classic that we were all clambering for her to revisit (Or maybe that was just me? ), The Locomotion. I cannot tell you how much fun I have had dancing around to this song. It has quickly become my favorite song to listen to while getting ready in the morning. It puts me in the perfect mood to start the day. Another stand out for me was Can't Get You Out of my Head. The strings and percussion in this arrangement set an intense and urgent tone that makes the original, released in 2001, seem almost lethargic (No easy feat for a song whose video features twenty some dancers dressed as what I can only guess to be futuristic race car drivers?). Maybe my favorite track is the previously unrecorded Flower, written by Kylie after her battle with breast cancer. The song is written for the child she hopes to one day have. It is a different kind of love song with beautiful lyrics, a gorgeous harmony, and once again the orchestra provides the perfect backing. 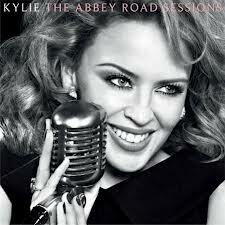 The Abbey Road Sessions is the perfect celebration of Kylie's 25 years in the music business. I recommend it for old fans, but it also serves as a wonderful introduction to those who have not listened to her in the past. I can't wait to hear what she brings us in the next 25 years! You can purchase both the CD as well as the digital download on Amazon for $9.99, a price even a cheapskate can feel good about. Special thanks to guest blogger Christopher W. Roberts for this great review. Look out for Chris's new blog “Chris Grows Up,” coming soon. In the meantime, you can follow him on Twitter @chriswillrob or on Facebook facebook.com/christopher.w.roberts.